In addition to the fragments already analyzed from the third round of the European Championship, our analyst Alexei Yarovinsky found two decisive games interesting. 1.Nf3 d5 2.g3 g6 3.Bg2 Bg7 4.d4 Nf6 5.0-0 0-0 6.c4 c6 7.b3 dxc4!? This is a somewhat ambitious strategy, played in hypermodern style: Black surrenders the centre, in return receiving the opportunity to exert pressure on it. The more “classical” solution to the problem of the centre is 7...Bf5. The game Giri – Kramnik, London, 2014, blitz, ½, continued: 8.Bb2 Nbd7 9.Nbd2 Ne4 10.Nh4 Nxd2 11.Qxd2 Be6 12.e4 dxe4 13.Bxe4 Bh3 14.Rfe1 e6 15.Nf3 Nf6 16.Bc2 Bf5. Black has less space but he doesn’t have any weaknesses or bad pieces; Kramnik managed to prove equality. 9...Qb6 It was probably more accurate to play the immediate exchange with 9...cxd4!? 10.Nxd4 Qb6. For example, that’s how the game Tkachev - Vachier-Lagrave continued (Gibraltar, 2013, 0-1). According to Michał Krasenkow, who annotated this game for ChessBase, Black has absolutely nothing to worry about. The author of this article has the deepest respect for the opinion of the famous GM Mr Krasenkow but believes that this position is too complicated to reach definitive conclusions and that it requires further deep analysis. For example, in the game Shankland - Wei Yi, Wijk aan Zee 2015, ½, White managed to create problems for his opponent after 11.Qc1!? Bd7 12.Nd2 Nc6 13.c5 Qa6 14.Qc4 Qxc4 15.Nxc4 Rfc8 16.Rab1. 10.Qb3 cxd4 If 10...Nc6 11.d5 it’s not easy for Black to prove that surrendering the centre is justified, for example: 11...Na5 12.Qxb6 axb6 13.Nfd2 Rd8 14.Nc3 Ne8 15.Rfc1 Nd6 16.Nd1, and White’s chances are better. There is no guarantee of equality either after 10...Ne4 11.e3 Nc6 12.Ne5. 11.Bxd4 Qxb3 12.axb3 Thanks to the powerful bishop on g2 White has good chances of creating pressure on the queenside. Black faces a tough struggle to gradually equalize. 18...Be8? This was a mistake, after which the pressure on the b7 pawn becomes extremely unpleasant. Maybe Benjamin Bok had carefully studied the article by David Arutinian and overestimated the advantage of the bishop pair in this game. He should have exchanged the strong knight: 18...Bxa4, with chances of mounting a successful defence. 19.Nb6 Rd8 20.Rad1 e6 21.Nb3! The knight is heading for а5 and frees up the d-file for his rook. 21...Bb5? It was time to throw caution to the wind with: 21...Nd5!, after which White doesn’t appear to have any clear path to victory. It’s a good time to repeat the maxim that chess contains a large number of defensive resources. 22.Rxd8+ Rxd8 23.Rc1 Nd7 (if 23...Nd5 then again 24.Rd1 is unpleasant) 24.Rd1 Bf6 25.Nxd7 Bxd7 26.Bxb7 Bb5 27.Rxd8+ Bxd8 28.f4! We now reach a technical endgame where White is a pawn up. Matlakov first opens up the path for his king while at the same time taking control of е5. 28...Kf8 29.Kf2 Bf6 30.Nd4 Ke7 31.Bf3! Threatening 32.Be2 – exchanging bishops makes it easier for White to convert his advantage, whereas exchanging his knight for the light-squared bishop leads to a drawn opposite-coloured bishop ending. 34...Bc8?! He would have created more problems with 34...e5!? 35.fxe5 Bxe5 36.Be2! Bxh2 (36...Bc8? 37.Nc6+ Kf6 38.Nxe5 Kxe5 39.Bd3 h6 40.Kc3 f6 41.Kb3 Kd5 42.Ka4 Kc6 43.Ka5 is hopeless) 37.Bxa6 h5 38.b5 h4 39.b6 h3 40.c6 Bg4 41.c7 Bxc7 42.bxc7 h2 43.Bb7 Bc8 44.Bh1, and White gradually converts his advantage. 35.Nc6+! The decisive knight journey. 35...Ke8 36.Ne5 Bd8 37.Bc6+ Ke7 37...Kf8? loses immediately after 38.Nc4 followed by Nb6. Now if 38.Nc4?! Bc7 39.Nb6 Kd8 the king comes to help the bishop. 38.Be4! Threatening 39.Nc6+ and transposing into a winning ending with same-coloured bishops, which is why Bok bravely decides to give up a second pawn, after which the struggle soon ends. 38...Bc7 39.Bxh7 f5 40.h4 Kf6 41.h5 Bxe5 42.fxe5+ Kxe5 43.c6 1-0 Very straightforward chess by the St. Petersburg GM. Anton Korobov converted his spatial advantage into an attack on the king. 1.d4 Nf6 2.c4 e6 3.Nf3 d5 4.Nc3 Be7 5.Bf4 0-0 6.e3 Nbd7 Apart from the move played top level chess also sees 6...c5 and 6...b6. 7.c5 c6 Alternatives are: 7...Nh5 and 7...Ne4. 10...Bb7?! Is this a novelty? In any case its merits aren’t obvious. The move 10...Ba6 has been tried at various levels. The game could continue 11.Bxa6 Rxa6 12.b5 cxb5 13.c6 Qc8 14.c7 b4 15.Nb5 a4 16.Rc1 Ne4 17.Ng5 Ndf6 18.Nxe4 Nxe4 19.f3 Ra5. Here Vishy Anand played a novelty against Magnus Carlsen in the world championship match (Sochi 2014) that brought him success: 20.fxe4 (instead of 20.Qe2, tried in the game Aronian - Adams, Bilbao 2013, 1/2). 11.0-0 Qc8 12.Re1?! In my view 12.Na4! is stronger, provoking 12...b5, after which Black’s light-squared bishop is really poor. Black can avoid this via 12...Ba6, but here too his position already looks perilous. 12...Ba6 13.Bc2! The Ukrainian sensibly rejects the swap. 13...Bc4 14.Nd2 axb4 15.axb4 Rxa1 16.Qxa1 Nh5 17.Nxc4 dxc4 18.Be5 He could also have attempted to gain an advantage with 18.Bd6!? For example: 18...Bxd6 19.cxd6 b5 20.Qa7 Nhf6 21.e4 Qb8 22.Qxb8 Rxb8 23.Ra1. 18...bxc5? Reducing the pawn tension, Black is condemned to never-ending torture. After the correct 18...Qb7! it’s not simple for White to prove an advantage. 19.bxc5 Bxc5 20.g4 Bb4 21.gxh5 Another good continuation was 21.Rb1!? Bxc3 22.Qxc3 Nhf6 23.Bd6 Rd8 24.g5 Nd5 25.Qxc4 N7b6 26.Qc5. In this position the bishop pair accord White a clear advantage. Here, on the other hand, thanks to the queens on the board, the bishop and knight are stronger than the rook. White’s larger number of pieces enables him to attack the Black king. 24...Qa3 25.h6 Ra8 26.Qe2 Qa1+ 27.Kg2 Qxe5 28.Qxc4 Qd5 29.Qc3 e5? 29...gxh6 30.Kg3 Qa5 would have been better. 30.Kg3 c5? Allowing a fatal pin. 30...Rb8 would have put up some resistance. 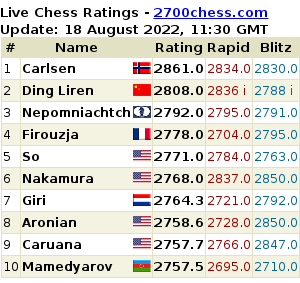 The top-ranked Fabiano Caruana has developed a clear lead after three rounds at Shamkir. He defeated Hou Yifan in the third round – the Women’s World Champion’s first defeat at the tournament. Why Exchange a Bishop For a Knight? Dear Readers. I decided to write this article, which I think will be interesting both to young chess players and to trainers who work with children. After four rounds of the Capablanca Memorial in Havana only three games in all have produced a victor. 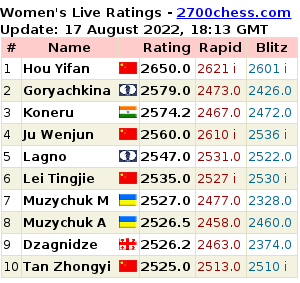 On two occasion his name was Vassily Ivanchuk and he is now a point ahead of his four closest rivals. Our analyst Alexei Yarovinsky was particularly inspired by one of Vassily’s games. Only a short time has passed since the triumph of Dmitry Jakovenko in the European Championship, and now this – a crushing defeat by his fellow countryman. Dreadful! Let’s try to work it out. The script of the currently played third game of the match turned out to be unexpected. Vladimir Kramnik started the game with the king's pawn and played one of the quietest openings in response to 1...e5. However, Levon Aronian chose a desperate strategy in response: he avoided the main variations, opened up the centre, sacrificed the queen for a rook and a knight, and, overall, got somewhat unclear dynamic compensation for the opponent's strongest piece.